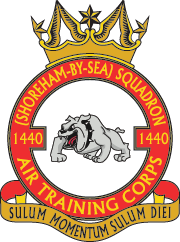 1440 is the Shoreham-by-Sea Squadron of the Air Training Corps, or Air Cadets as it’s more commonly known. The Squadron has been in existence since 1941 and is going from strength to strength today. Cadets are able to join the Squadron from the start of Year 8 in school. From hereon in, they can take part in a wide range of activities such as powered flying, gliding, shooting, the Duke of Edinburgh’s award, sports and much more. The Squadron’s marching band is frequently requested to perform at a number of public engagements, and cadets from the Squadron have been involved in local, regional and national activities on a regular basis. Once the cadets have reached a certain stage in their training within the ATC, they are eligible to take part in national and international camps. These specifically take place at different RAF bases across the country/globe, during the Easter and summer months, and the cadets will have the chance to mix with around 40 other cadets for a week. They will live and breathe the RAF, taking part in section visits to different areas of the RAF base, and carry out numerous different types of activities. The ATC also offers overseas camps in places such as Gibraltar, Cyprus, and Germany, and also takes part in the International Air Cadet Exchange (IACE) programme that provides the opportunity to visit many countries around the world. As well as all the above activities, the cadets also undergo training in drill, dress and discipline – they are taught to work together with each other as a cohesive unit. They also take instruction in a variety of subjects from aircraft handling to satellite communications, and through this are able to achieve higher classifications within the ATC. These skills acquired also count towards achieving a number of BTEC qualifications which are available as part of the ATC training. The Squadron has close links with the community, providing invaluable opportunities for cadets to become a part of their local community by helping out at local events. We maintain close links with Shoreham Airport and other local community businesses and organisations. If you’re interested in taking part in the Squadron – as a cadet, an adult volunteer or in any other way – or in learning more about what we do and how you could help, we’d love to meet you! We parade twice a week, on Tuesday and Thursday evenings. Details are on our contact page.